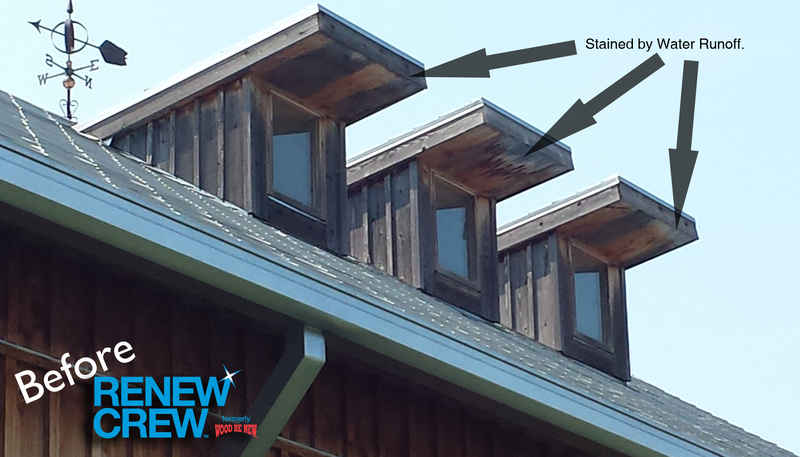 The City of Olathe did not enjoy the water stains that were showing up on the Heritage Center. If you don’t know already the Heritage Center is Located at the Mahaffie Farm just off of Kansas City Road and Ridgeview. It hosts Weddings – Receptions – Business Meetings and even has the history of the Mahaffie Farm with a museum. 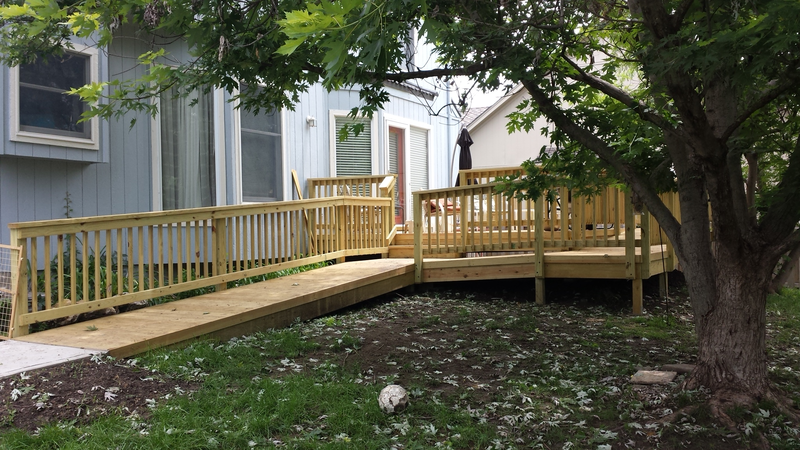 Stop by and check out our work and while you are there take a tour. This was what the view looked like before. A little challenging to get to but the end results are GREAT! 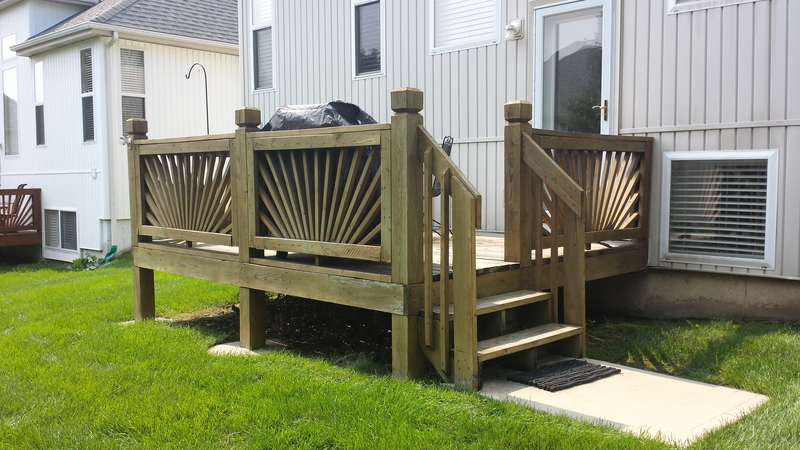 The was a combo package with a Fence, Front Stoop/Deck and rear Balcony. 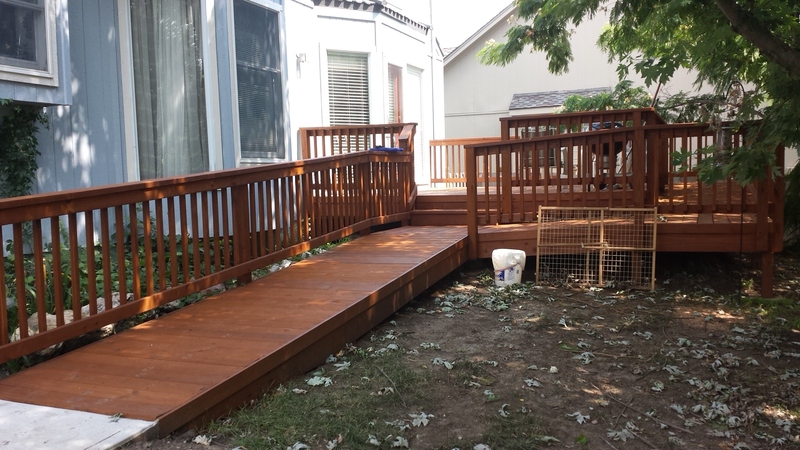 As of completion of this customers project we have received calls from the neighbors to bring their decks and fences back to life. 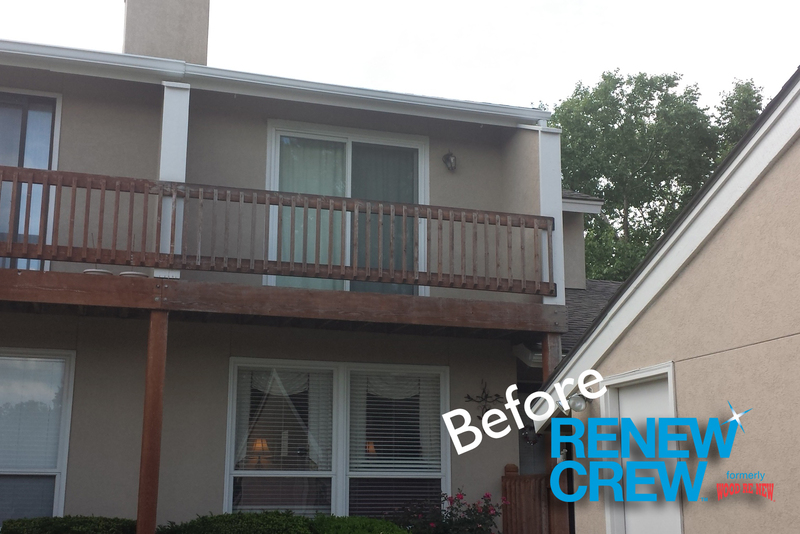 The back balcony that hooks up the neighbors needed a good cleaning and protection. 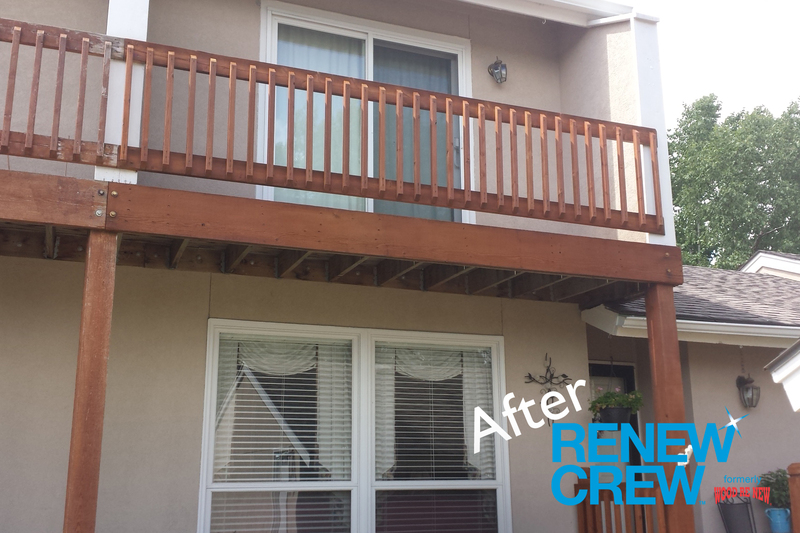 The back balcony after we had finished. 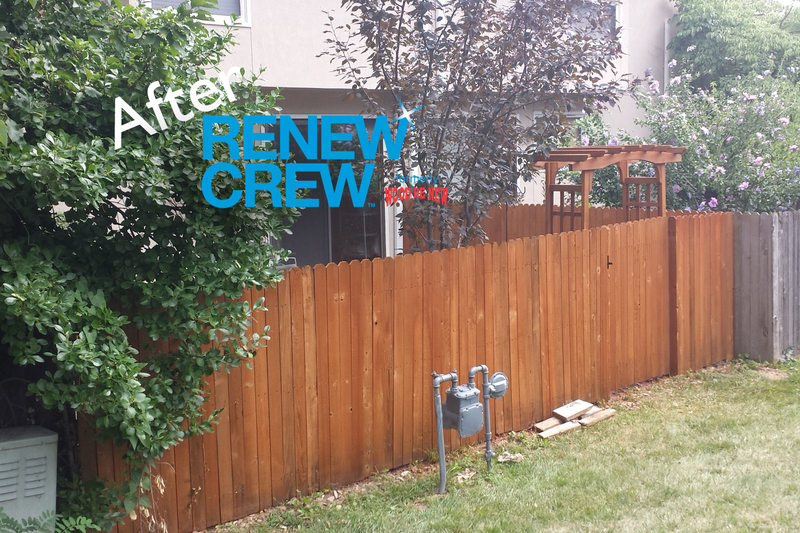 Very proud of how the crew was able to keep any trace of our work off the neighbor’s wood. 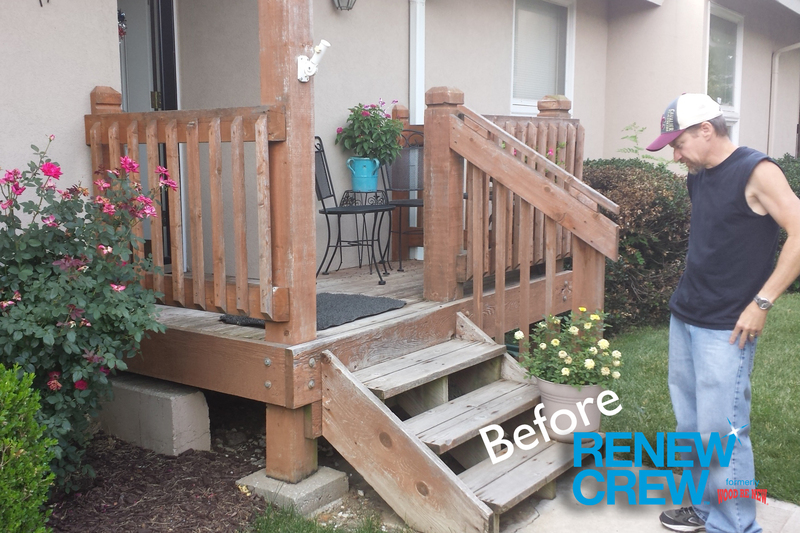 The front stoop makes a HUGE impact on family and guest when they arrive at your door. So the Conrad’s wanted to bring it back to life. Now guest have a warm inviting walk into the house. And as you can see here Mr. Conrad was excited to get the fence done and possibly become the next project of the week. And this is why he was excited about having us do his fence. We brought that “better than new” look back. 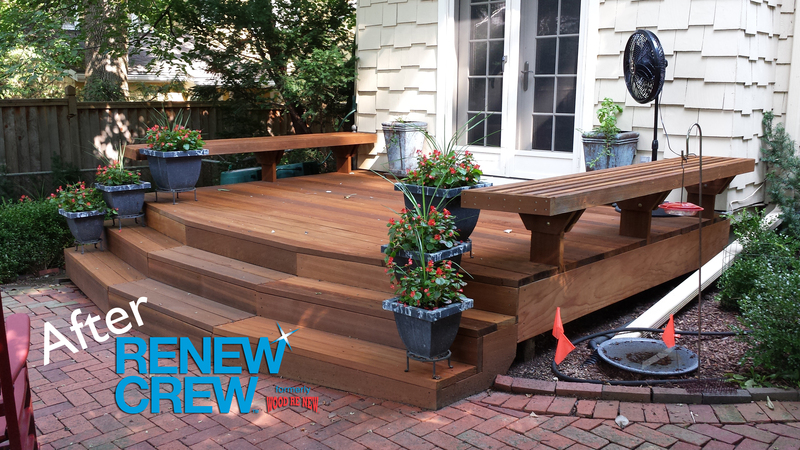 This deck was built by our sister company Archadeck out of treated “Yellow” wood. 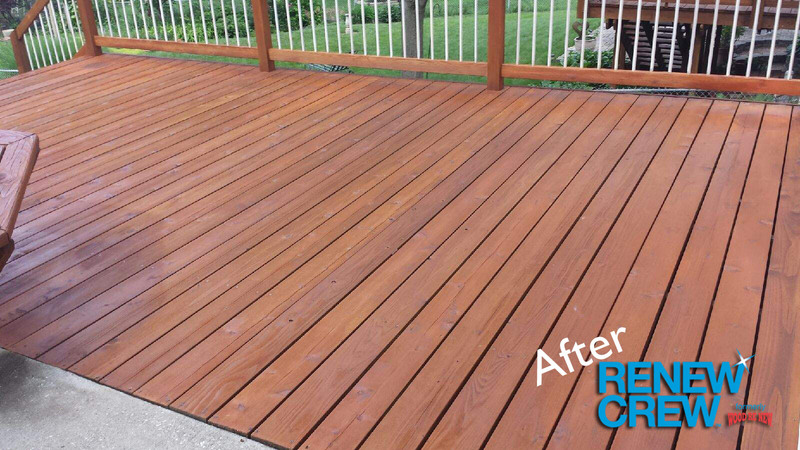 We wanted to bring in a more natural look to the wood with our protectant. 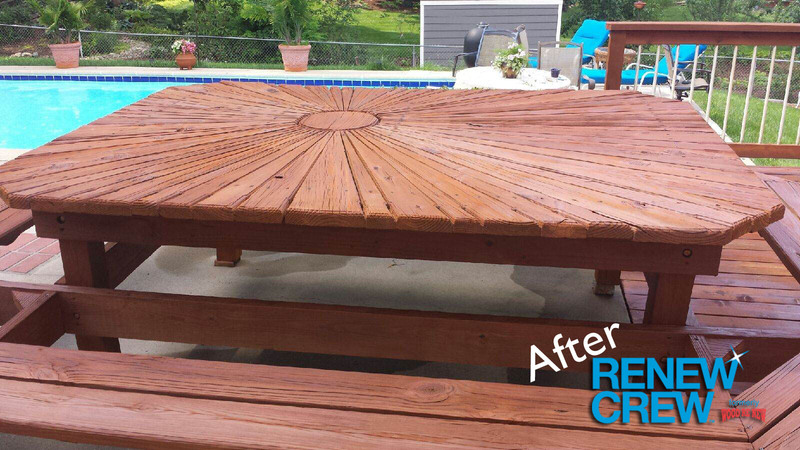 I think it turned out great with a more natural cedar look. 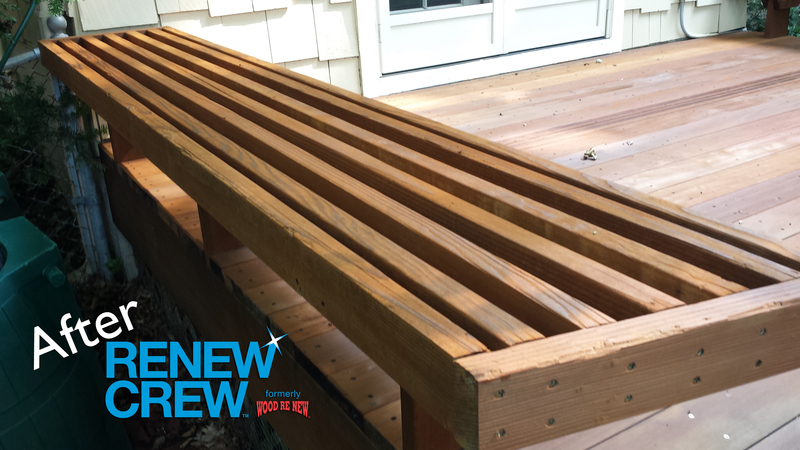 Deck before Renew Crew, notice the yellow look of the treated lumber. 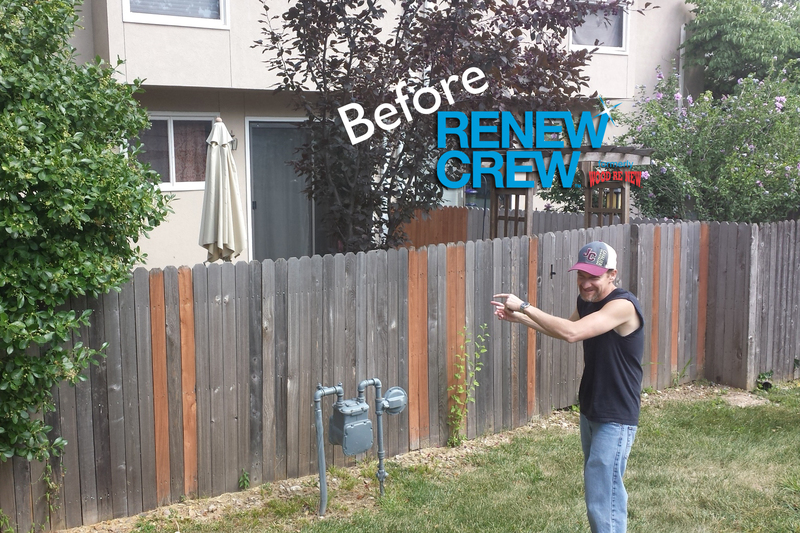 After Renew Crew. 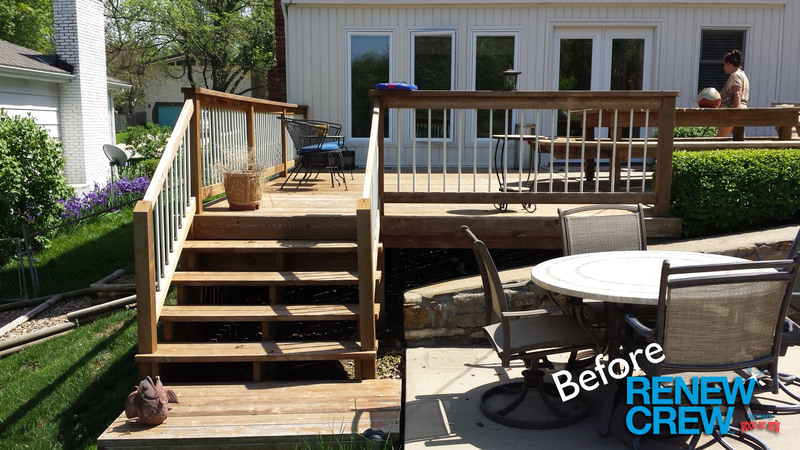 Loving the new natural look to the deck! 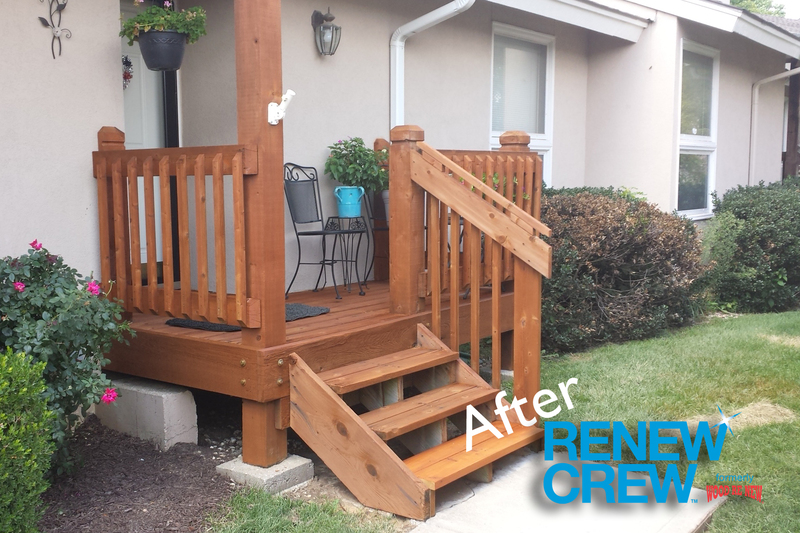 Even decks with stainless steel balusters are no problem for us at Renew Crew. Notice how well the wood sucked in the product giving it a rich new cedar look. 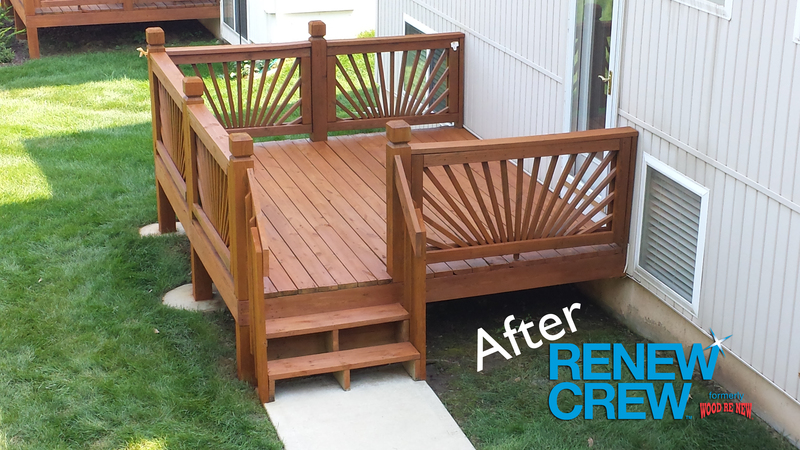 Not only did we enhance the deck but the custom made table and a privacy fence around the yard to protect the pool. 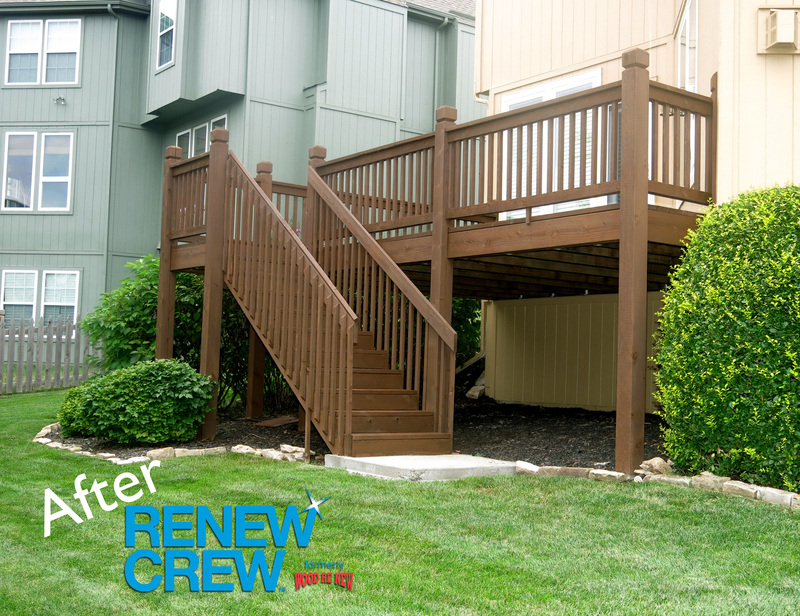 Deck before Renew Crew, notice the steel balusters. 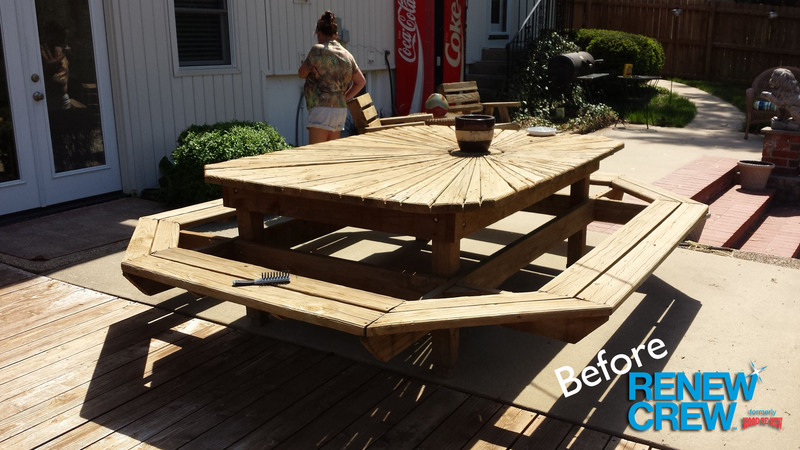 Custom Table before Renew Crew. Close up of the Table after. 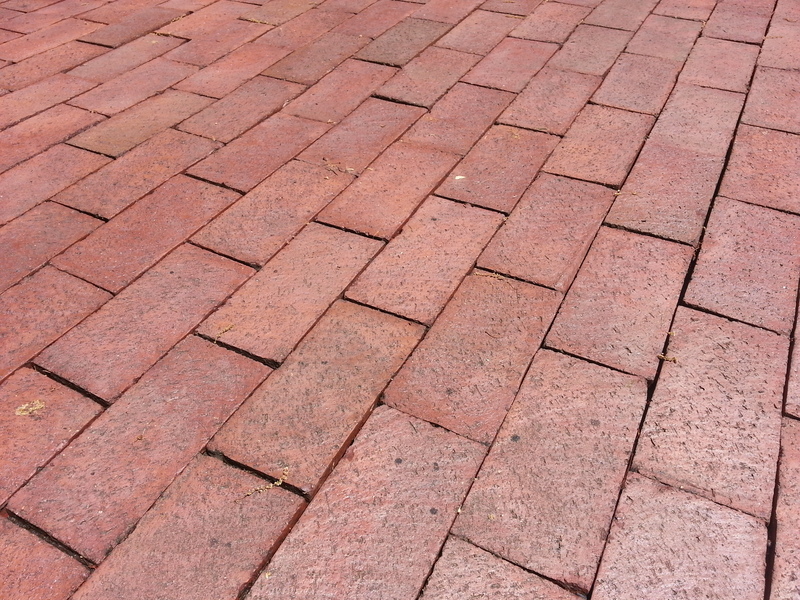 This walkway was done multiple times by another company – building to a cloudy mess. 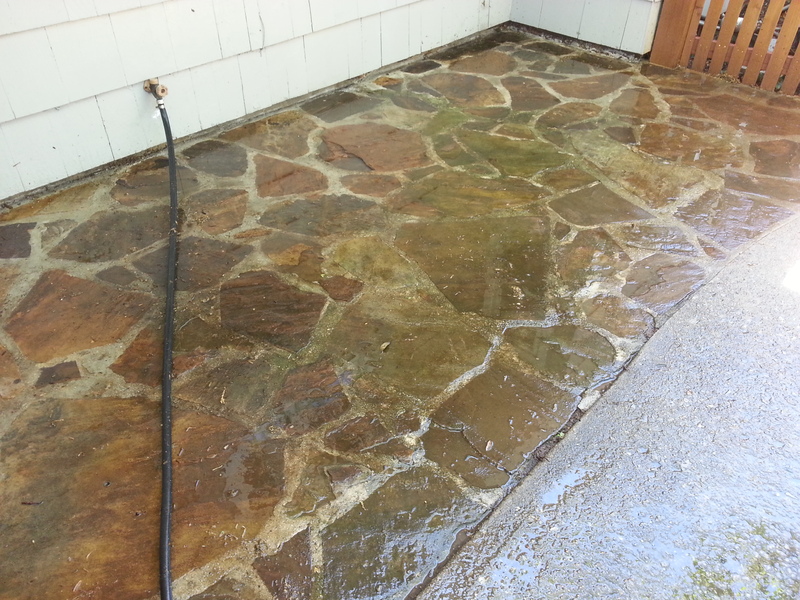 We came in, did a deep clean and reseal to bring back that beautiful natural wet look of the stone. Before with the cloudy mess. 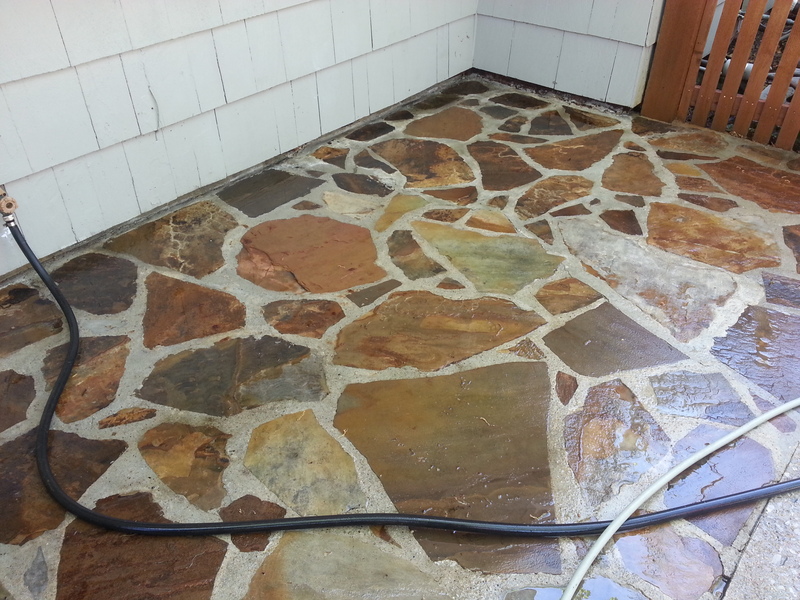 Natural wet look of stone. 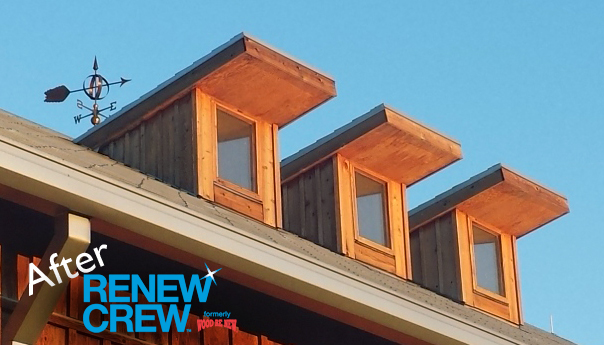 I do have to point out that the cloudy look you are seeing on the edges is reflection from the house, not over application like before (thats what happens when you have a nice shine). 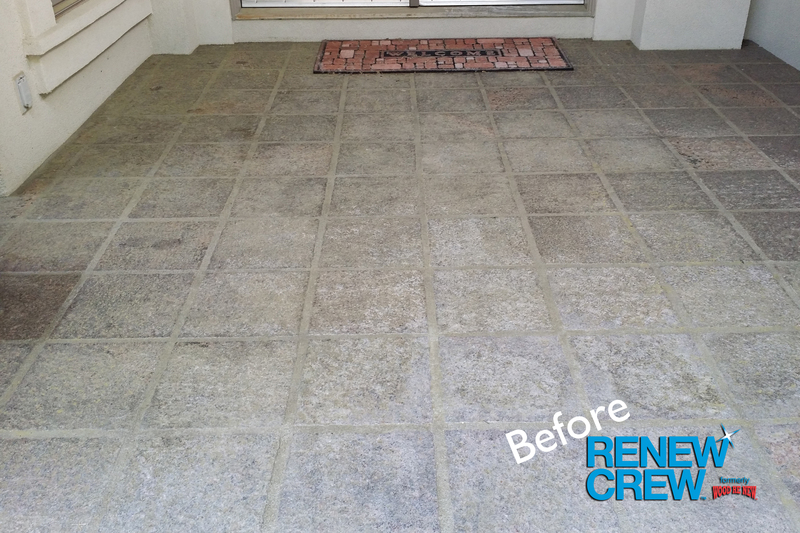 BEFORE – Prior stain with heavy wear and lacking water repellent! 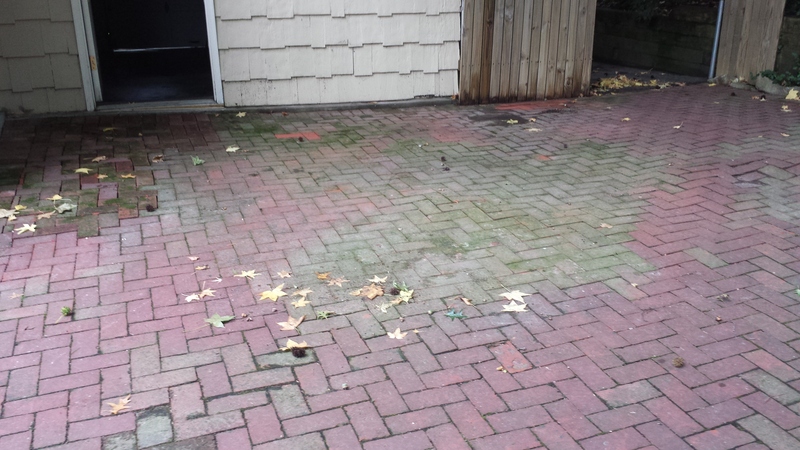 BEFORE – This deck had TONS of mold and Lichen! BEFORE – Good view of the Lichen – a fungus and alga growth growing together. 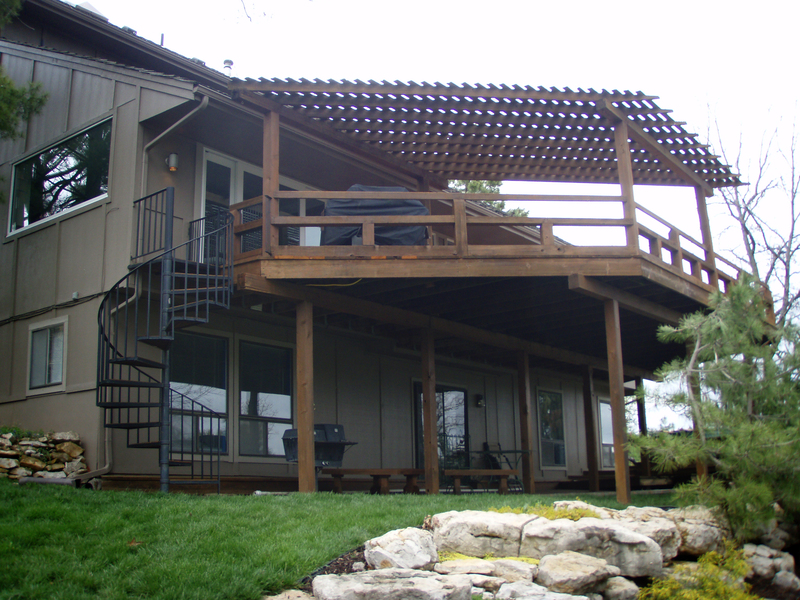 BEFORE – The “Deck of the Week” this week is a Hardscapes patio. 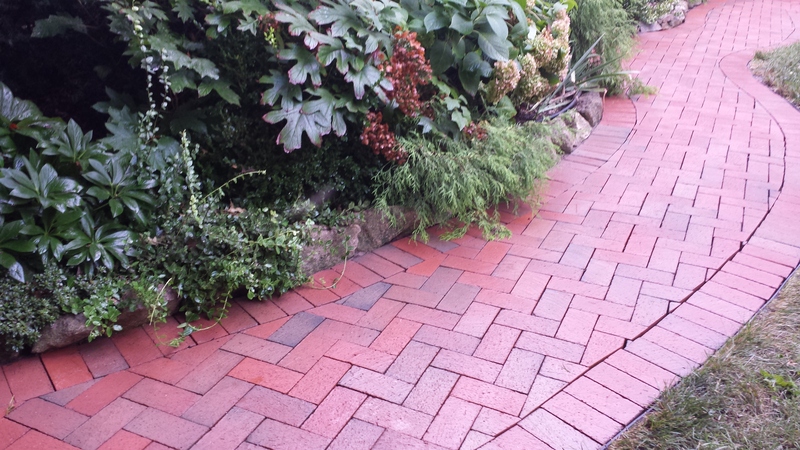 Notice the dark old look of the brick. 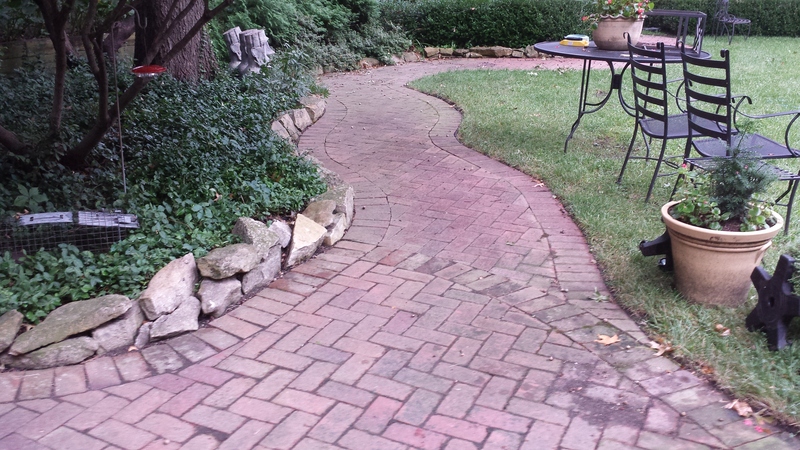 BEFORE – Not only did they have a nice brick patio they had a natural stone area as well. 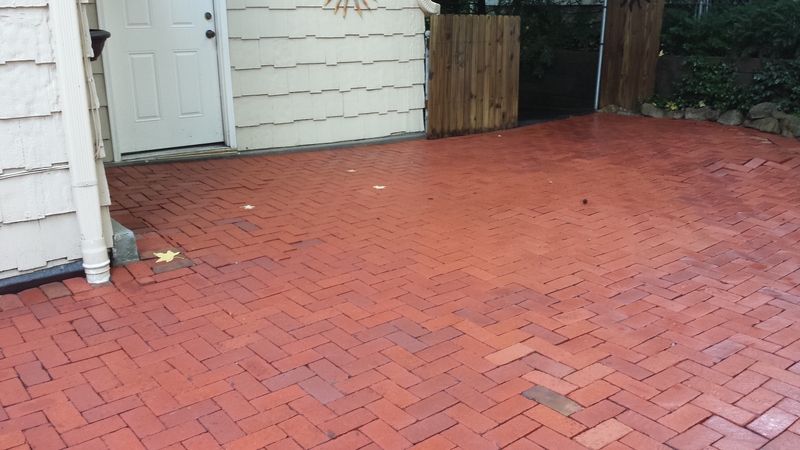 AFTER – Notice the nice red color of the brick is back after we removed the organic stains from the leaves in the fall. 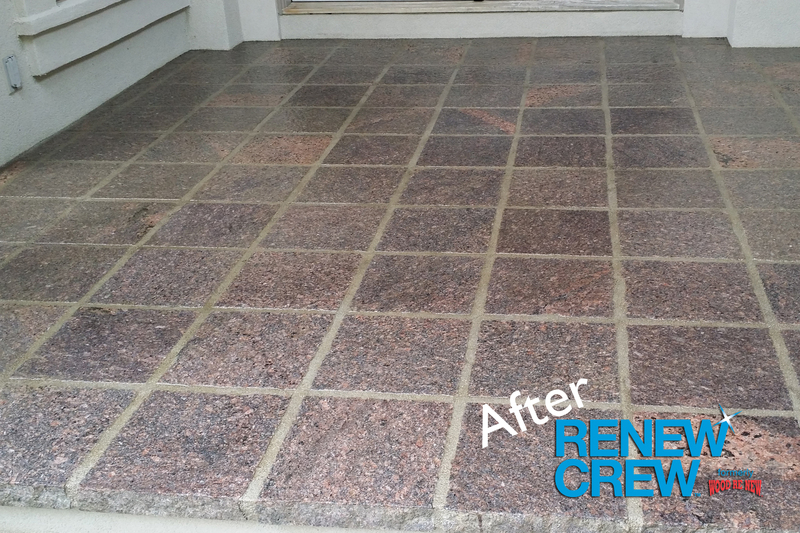 AFTER – We were even able to bring back the vibrant colors of the natural stone. 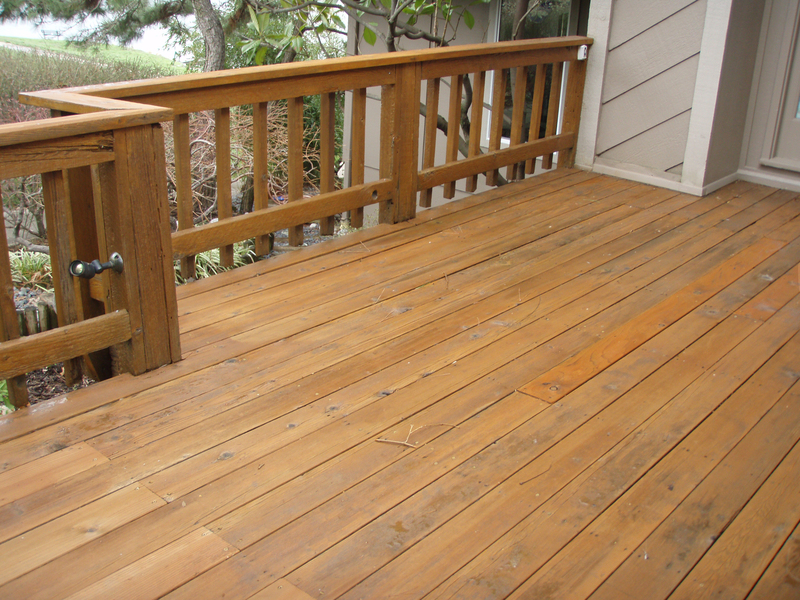 BEFORE – Prior “Stain” had failed letting UV damage and Water damage to the deck. 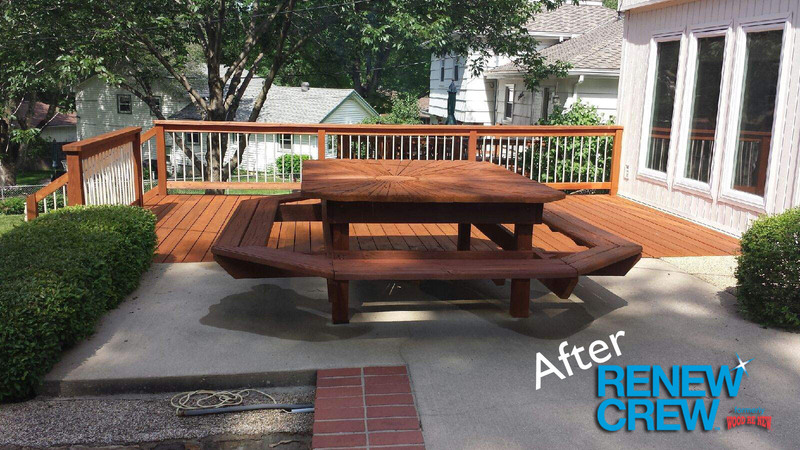 AFTER – Notice the angle of the photo on the after. 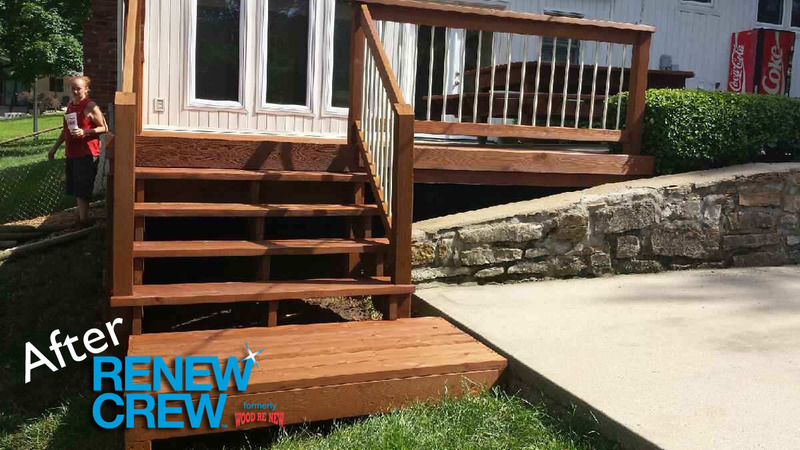 This is because we are now doing the neighbors second story deck! This is the 2nd time Tom has been Deck of the week. 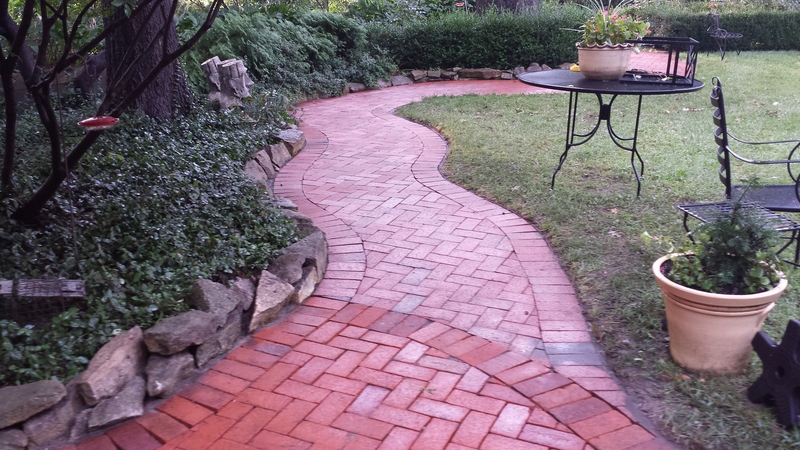 He liked our work so much he trusted us with his brick patio and walkway around his yard.